Do we need brain exercises to keep mentally fit? Some of my friends think we do and work out online with programs like Luminosity. Science so far says no to games, yes to learning new things, such as a language or musical instrument. I’ll leave more evolved answers to experts. I’m not big on computer games or puzzles, prefer learning by reading and writing. And just dealing with everyday challenges is often enough for me. If I don’t stay alert, I can get run over by a car or a tyrannical government. Or have to pay for my 50th bag because single-use plastic bags are now banned in California (a ban I support) and stores are charging us for paper bags and reusable plastic ones. And because I’ve left the other 49 tossed in my kitchen or car. And forgotten that cool canvas tote and the mini-tote my kids gave me for Christmas. They are either 1) in another purse or 2) hanging with my purses in my bedroom closet. So how to remember? I joke with all the store clerks. They don’t remember either. I could Google for ideas. But I’m stubborn and like to learn on my own (aka the hard way). I like to imagine and analyze. 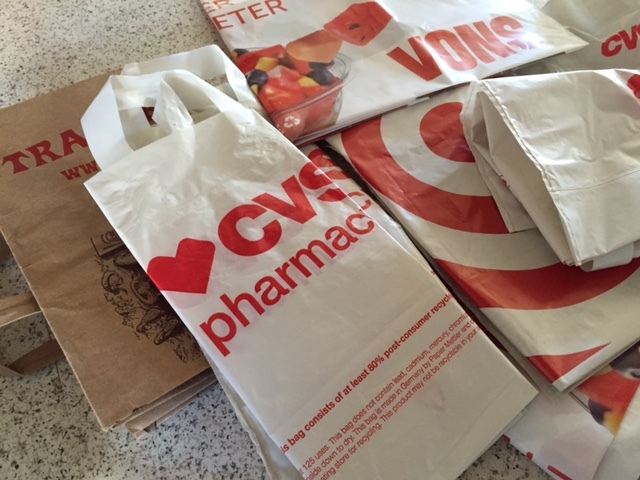 I need to keep my bags in more than one place since I shop in different ways. Sometimes I drive, sometimes I walk to a store and sometimes I stop in spontaneously while out walking. Since I most often drive alone, it makes sense to pile some bags on the front passenger seat. They are too easy to forget in the trunk. I have a small kitchen, so not much room there for extra bags. I already stuff baking pans in my dishwasher, which I never use. I could make room for bags, but as with the car trunk, out of sight, out of mind. My mental powers do not yet penetrate metal. 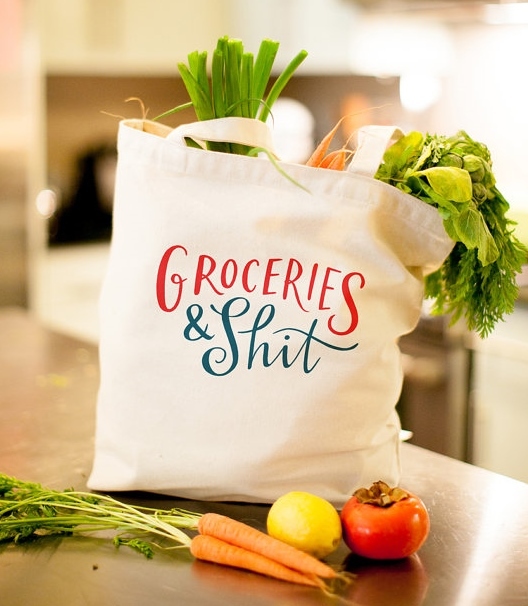 Perhaps a hook for the more attractive totes? Not much wall space either. 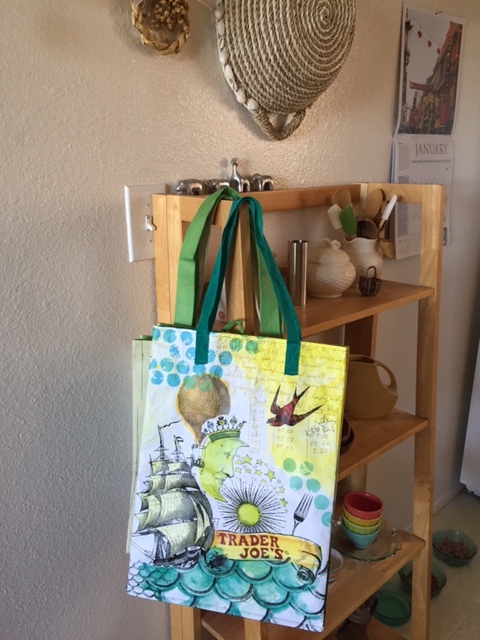 Now that I think about it, remembering to always carry the mini-tote in my purse is probably the best solution. Always with me, like my wallet and lipstick and iPhone and keys. Then – remembering it’s in there! I’ve left stores several times now, paying for a bag and then realizing halfway home that the little tote is still inside my purse. But I am starting to remember. Grab one before I get out of my car or yank from purse before I reach the checkout counter. A new habit, light gradually revealing a conscious image, synapses connecting. It took a year to navigate the debit/credit card chip reader scenario, to learn to be quick before the clerk flashes a new screen. (The clerks and screens are all different.) I do that pretty well now, except when the bag boy or girl interrupts to ask: Do you need a bag? Paper or plastic? Habits take approximately 66 days to form, according the latest research. Another month to go. And I’ll have bags, bags, bags for life. And then be ready for the next challenge. Bring it on. Next Next post: Should We Raise or Lower the Bar?